Who doesn’t want an easy, delicious meal the whole family will love? Try our crowd-pleasing Chicken Tater Tot Casserole tonight. Chicken tater tot casserole and our Breakfast Tater Tot Casserole are two great ways to start the day. They work for breakfast, lunch, or dinner and meet the definition of quick, easy, and delicious. This creamy chicken tater tot casserole with sour cream overflows with flavor and a delectable texture. 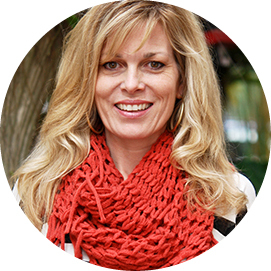 Great to serve at parties, potlucks, or any meal when I’m looking for something hearty, gooey and easy-to-make. Chicken tater tot casserole is easy to prepare. Spray cooking spray on a 9 x 13 pan . Blend soup, sour cream, Worcestershire sauce, milk, lemon juice, bacon, ranch dressing mix, and black pepper in a large mixing bowl, then stir in the chicken. Transfer the chicken/ mix to the baking dish and place the tater tots/ cheese. Bake, then after it’s cooled sprinkle fresh parsley and serve up your creamy chicken tater tot casserole Facebook ready meal. There are some amazing ways you can tweak this chicken tater tot casserole Food Network style for a delicious meal. Offer BBQ sauce on the side for dipping, or layer it on over the casserole before or after you bake. I personally like to add a bit to the creamy sauce, as well as drizzling some across the whole top immediately after the casserole comes out of the oven. Another variation is axing the cream soups and replacing them with sour cream, cream cheese, and a little milk. You’ll need a ratio that equals the same basic creamy to liquid content of the soup, which is where the milk comes in. Use the milk to thin the cream cheese and sour cream to create the perfect texture. This is a great alternative for anyone who would like a gluten free breakfast casserole. Another popular variation is turning this casserole into a Mexican chicken tater tot casserole. Simply change up the spices and cheeses a bit. Chicken tater tot casserole with sour cream makes for a creamy, rich meal that the whole family is sure to enjoy. So I like to accompany it with well-balanced options loaded with veggies. Some of the best beverages to serve with creamy chicken tater tot casserole Best Bites include Southern-style sweet iced tea or lemonade. Traditionally, Southern sweet tea uses a black tea blend or offer a blend of teas for an intriguing taste that melds with the sugar for a delightfully sweet, cooling drink. Basically, anything that tastes great with a hearty, creamy dish will taste great with chicken tater tot casserole. If you need more yummy chicken casserole recipes, I’ve created a list of my favorites that you might like. Looking for a Tex-Mex meal? The chicken tortilla casserole is a delicious mix of rotisserie chicken, cream soups, chickens, tortilla strips, and zesty spices for a delightful dish your whole family will love. Combining the creaminess of Cream of chicken soup, the gooeyness of cheese, and the glorious slurp of a good spaghetti noodle, the Chicken Noodle Casserole is sure to please the whole family. It’s also great for potlucks and parties. If you’re looking for the ultimate creaminess in casseroles, check out the Creamy Chicken Casserole. Your whole family is going to go crazy over it. The name of this recipe says it all: Easy Chicken Casserole really is easy. And delicious. So it’s a crowd pleaser all around — you love it because it’s easier, they love it because it’s completely yummy. Win-win. Chicken broccoli casserole is often a guest at our table. Broccoli, and chicken combined with cheese are a natural fit. In this Chicken Broccoli Rice Casserole, you get it all and more. So good, you’re gonna want seconds! Who doesn’t love chicken with stuffing? How much better is a chicken stuffing casserole you can dish up any time? Follow the simple instructions for something totally delicious and homey. A good scoop of cheesy goodness is hard to resist. 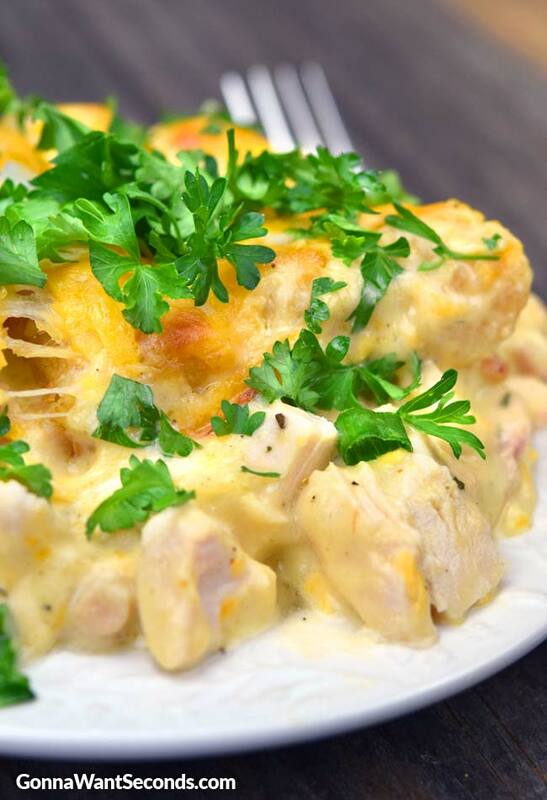 Try the Cheesy Chicken Casserole this week for a quick, easy dinner everyone’s going to go gaga for. 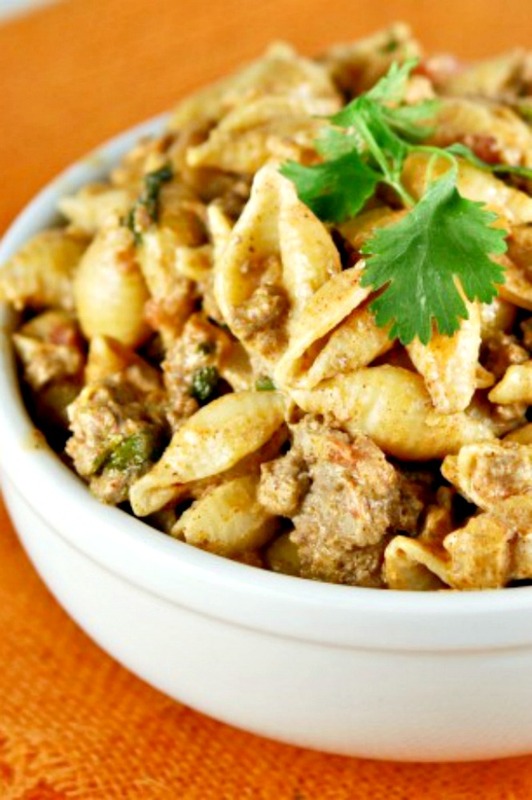 Mexican Chicken Casserole gives you all you want in a hearty meal. Spice, creaminess, chicken, deliciousness. The whole family is going to love this one. 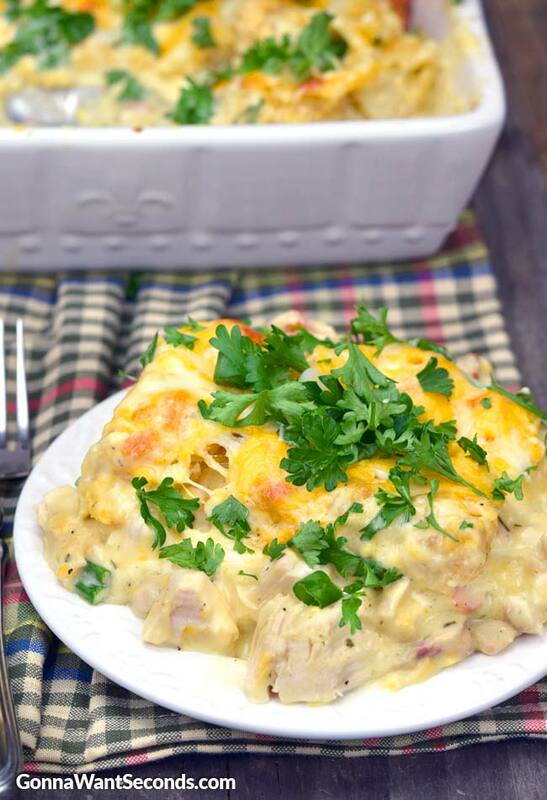 Bringing together the goodness of Swiss cheese, ham, and egg noodles, this Chicken Cordon Bleu Casserole is amazingly delicious and super easy to make. Your family is sure to love it. Another one of the best combinations of flavor is chicken and bacon together. Toss in ranch dressing, and you’ve got the perfect meal. 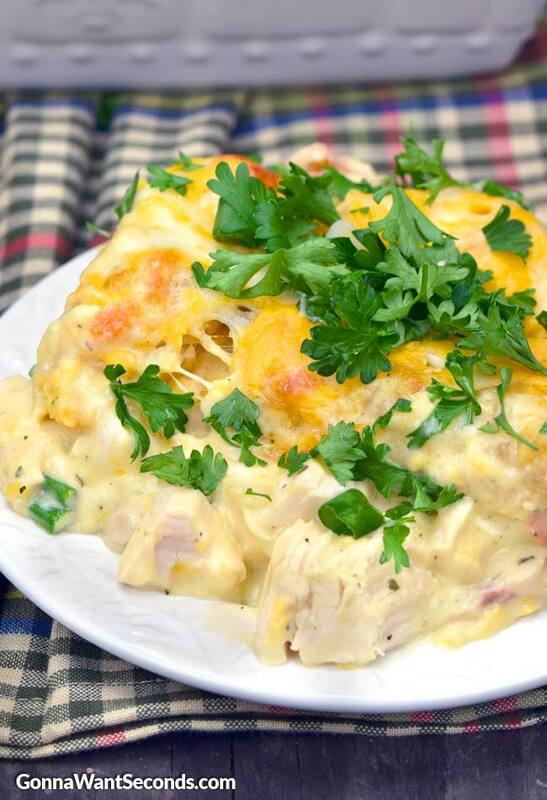 The Chicken Bacon Ranch Casserole is a tasty, easy-to-make meal that everyone is going to love. I hope this Chicken Tater Tot Casserole Recipe frequently visits your table as it does at ours. 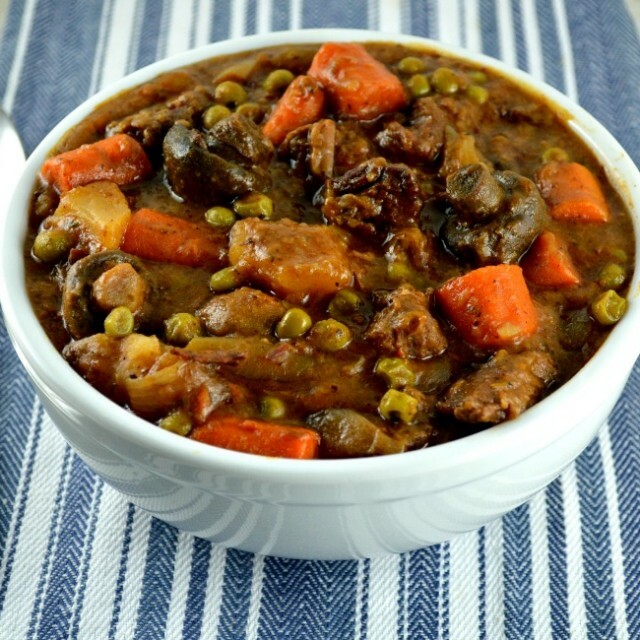 This casserole provides for you to let your creativity flow so have at it, and enjoy! Rotisserie chicken works well with this recipe, and I love the simplicity.When I’m out shopping, I try to always pick up an extra rotisserie chicken. Even if I freeze it, they never go to waste. Big family barbeque leftovers? Grilled chicken is a winner in this recipe. If you’re really ambitious and want to start with uncooked chicken, it’s still easy to put together. It doesn’t matter if you poach the chicken, chop it, or shred it. Whatever works for you. 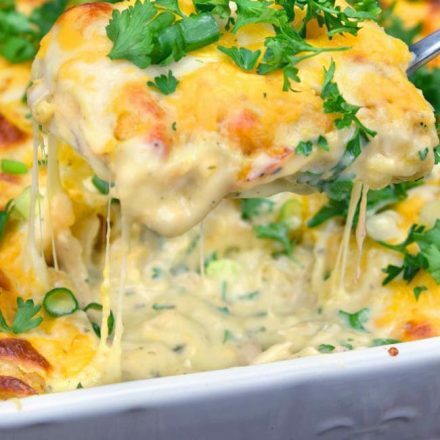 Adding Vegetables: I haven’t added any vegetables to this recipe but, adding cooked or thawed frozen veggies make a great addition to this casserole!!! If you choose to add the extra vegetables, just make sure you thaw them and drain them with extra care. You don’t want any extra water in this dish—it dilutes the cheese and sauce, thinning away that wonderful creaminess that makes this recipe so good. 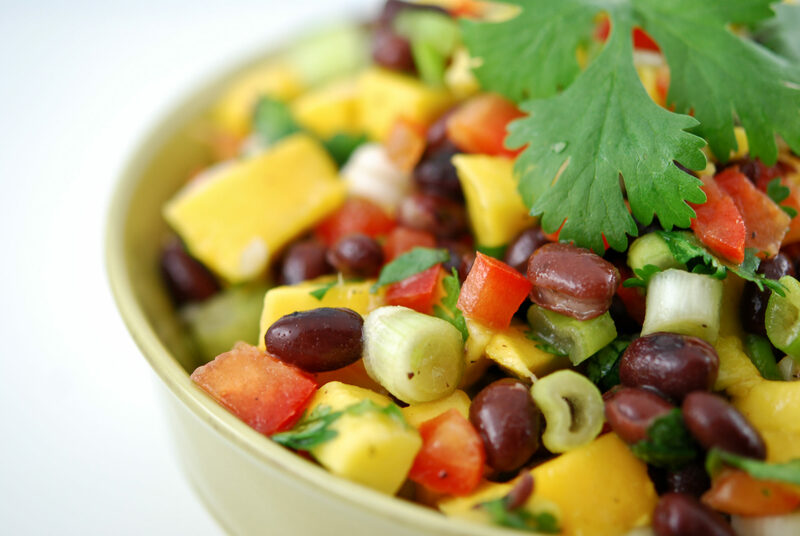 Adding vegetables has the extra benefit of eliminating the need for a side dish. That’s why I often add them when I’m running short on time. Broccoli especially helps to fill the recipe out in nutrition and substance, making sure no one goes away hungry. Cooking: With this recipe for chicken tater tot casserole, ovens need to be watched carefully. There are some pretty specific baking instructions in the recipe, and while you won’t ruin the dish by leaving the cover on the whole time (as an example), it certainly won’t have the texture that you’re looking for. Because casseroles are so thick and often have many layers, you want to follow the baking instructions on your recipe as best you can. Who doesn't want an easy, delicious meal the whole family will love? 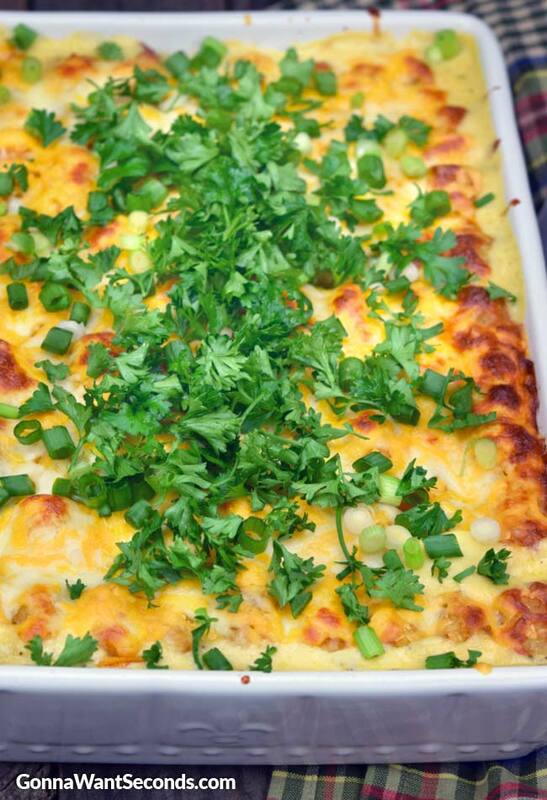 Try our crowd-pleasing Chicken Tater Tot Casserole tonight. Preheat the oven to 350 degrees. Spray a 9 X 13 with nonstick cooking spray. Set aside. In a large mixing bowl, combine the soup, sour cream, milk, Worcestershire sauce, lemon juice, bacon, ranch dressing mix, and black pepper until thoroughly combined. Stir in the chicken. Transfer into the prepared baking dish. Top with Tater Tots then cheese. Cover the casserole and bake in preheated oven for 35 minutes. Uncover and bake 5-10 minutes or until heated through and golden. 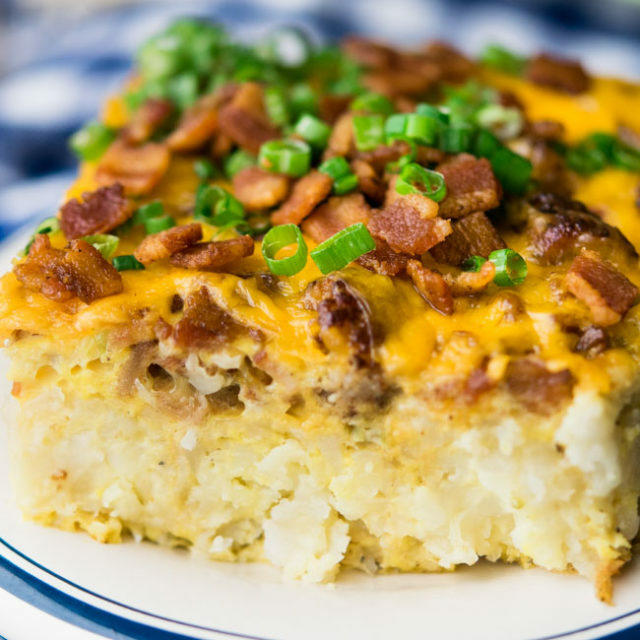 Tater Tot Breakfast Casserole – Our Easy Tater Tot Breakfast Casserole takes minutes to assemble. 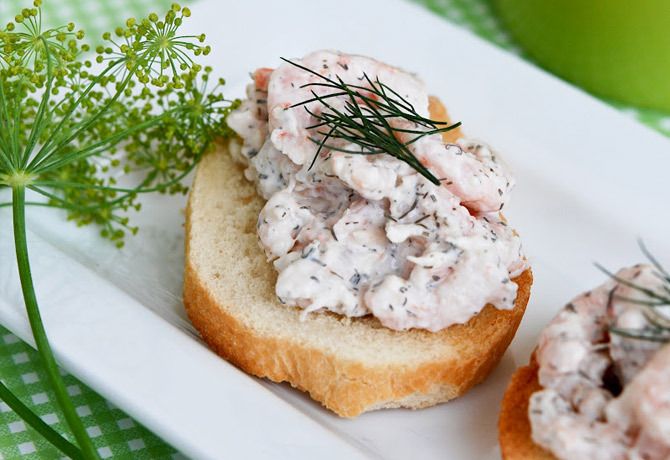 Truly a perfect one-dish meal for a family breakfast, fancy brunch, or a church potluck! Chile Relleno Casserole -Infused with all the taste of a chile relleno without all the mess and fuss! Cabbage Roll Casserole – Hearty and filling, while simultaneously being quick and easy to put together! Chicken Tortilla Casserole– Always a hearty family favorite, Chicken Tortilla Casserole makes the most of convenient ingredients while packing tons of rich flavor in every creamy bite! No Peek Chicken – Ready for quick and delicious, No Peek Chicken nails it. Impressive enough for a special night, yet it’s perfect for a family dinner! 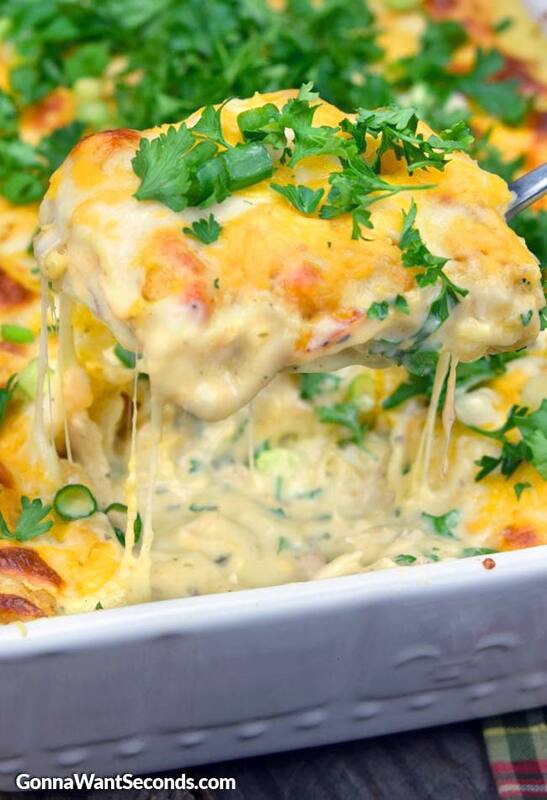 Chicken Divan– A rich, creamy casserole, Chicken Divan is easy to prepare and store. Packed with broccoli, cheese, and juicy chicken, the dish can feed a small militia! Bisquick Breakfast Casserole – This easy cheesy Bisquick Breakfast Casserole is loaded with sausage, egg, potatoes, and peppers. Famished folks, this feast has your name on it! Previous RecipeCrock Pot Pork Chops-Smothered in Mushroom And Onion Gravy! Ohhh boy! I know what’s for dinner tonight in my house! 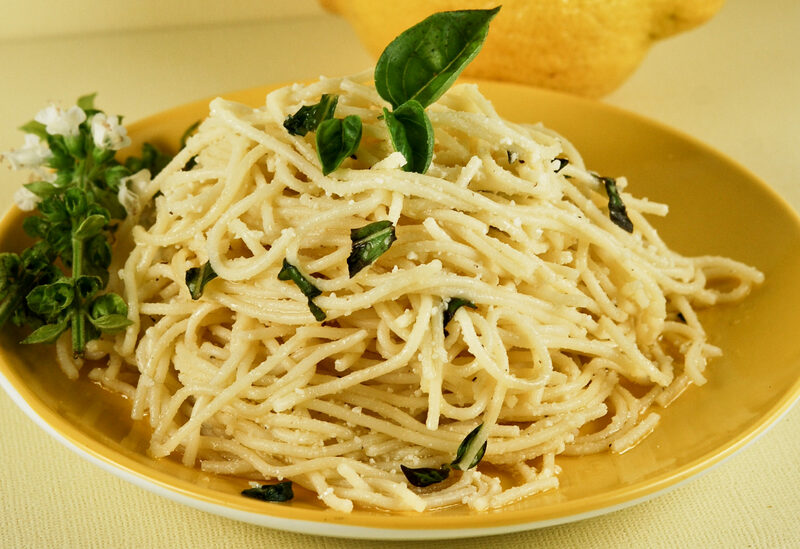 I am a diabetic, and i noticed the Total carbohydrates for this dish said only 4grams. That can’t be right! Is it a typo? Hi, Bev. Thanks for noticing! We’ve now corrected it. Can this be frozen, then taken out and baked? Wanting to take to someone that is getting ready to have surgery and will need meals for a bit. Ingredient list doesn’t include broccoli, and the directions don’t include the bacon? Hi Alayne. The Bacon is add in step 2 right before the ranch dressing. Broccoli is an optional ingredient that can be added cooked, at step 2 after the chicken. Hope that helps 🙂 LMK!